Plano's bowcase features a thick wall design, structural pillar support protects optics. 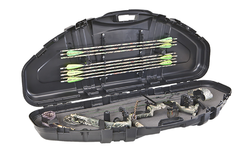 Inside it has velcro bow straps and an elastomeric arrow holder for carbon or aluminum arrows. Size:49"x 19.50"x 6.50".